When I was contacted about reviewing Ann Mah's, Mastering the Art of French Eating, I couldn't have been more delighted. This is one of those sumptuous reads that I was dying to get my hands on. The whole title just draws me in; Mastering the Art of French Eating: Lessons in Food and Love From a Year in Paris... 'French', check, 'Eating', check, 'Food', check, 'Love', check, 'Paris', check. This is my kind of book and when it arrived, I was not disappointed. It's one of those gorgeous books that I know I will not be passing on but will keep for myself to decorate an end table or nightstand to open up when I need a dose of deliciousness or to bring into the kitchen for a recipe. "I know it's a little, well, cliché to be captivated by Provence, a region that has made the fortune of not a few travel writers. But I am - I can't help myself. These are some of the things I love: Proud pink villages perched on hilltops. The relief of moving from sharp light and heat into cool shadows. Unapologetic ice cubes tinkling in a glass of rosé. The gusty wind known as the mistral, rough and cleansing. Unfiltered olive oil decanted into recycled juice bottles, bought at a roadside stand. Lavender-scented breezes tumbling into car windows. Tangy Provençal accents. Vineyards and fields shadowed by the looming bulk of the Luberon Mountains." After reading that paragraph, I was hooked, Mah nailed it. With the Provence chapter comes a recipe for Soupe au Pistou, a dish that Papa's Wife makes gallons of every summer. I looked over the recipe and am happy to report that it would meet Papa's Wife's approval. Well done Ann Mah, well done. 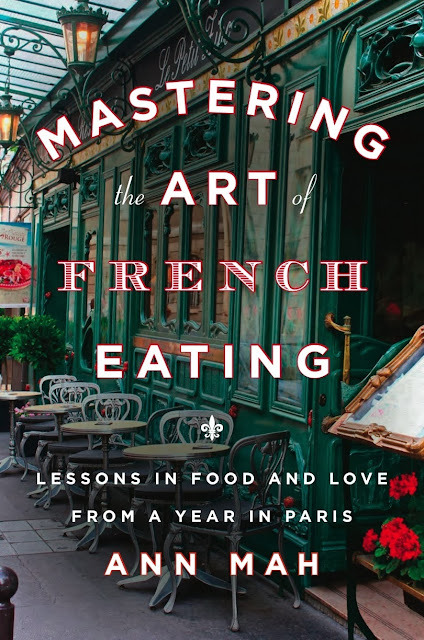 Since the holidays are around the corner and I know that you guys would love Mastering the Art of French Eating as much as I do, I'm giving away one copy to one of you! This sounds like my kind of read. Travel meets cookbook. I think I am going to go to France and eat now. My fav thing to cook or have cooked for me is a seafood risotto or fish pie. This sounds like a wonderful read. I love to taking coking classes when I travel so I can have a life long "souvenir" to take back home with me. I would have to say my favorite thing to cook is chicken parmesan and I love to have seafood cook for me (because I am absolutely horrible cooking it for myself). This sounds like just my read. I did the "Spanish thing" (majored in it, lived in three different Spanish speaking countries) and yet travel/expat narratives about France are what I'm most drawn to ha ha. I'm curious if you've ever read Elizabeth Bard's "Lunch in Paris?" Also a good read, with recipes too! This caught my eye somewhere online a while ago and I really want to read it. Especially since I studied abroad in Aix-en-Provence last year, and have been missing it like crazy recently. That paragraph you excerpted just made me sigh with longing. And my favourite thing to have cooked for me... definitely my momma's turkey dinner, à la Thanksgiving or Christmas. Want! And yep like Jamie says, if I don't get it it's going on the Christmas list. The title alone would draw me in to this! Fantastic that you were able to review this... when I was studying in France, I did some research on the differences in culinary identity and how it reflexively constructs regional identity throughout France! I'm usually one to eat simply and roast or sautee anything in olive oil, but the dinner that I made for my Rouennais host family will forever be one of my best: wine-braised beef and vegetables, a green bean casserole recipe from home and readapted, a gruyere souffle that did not rise but was enjoyed, and an apple-pear tarte Normande. It was just around this time as well, so I hope you enjoy Thanksgiving and combining American culinary tradition with your appetite in France! I really like to bake :) especially cookies, because they're the best to eat while actually in the process. but outside of that, any recipe that incorporates brown butter is pretty much my favorite. Sounds great. My kind of book. I will add it to my Christmas Wish List as well. Breakfast in bed. Preferably around 11am. Yummy! I don't really cook much French food, maybe the occasional quiche (I suppose I'm in the region for it now) or crêpe or so forth, so it would be good to get some more ideas! I love to cook most things, really, but especially a good Italian or Asian meal. What a great giveaway!! I admit I have gotten away from French cooking lately, but I do love a good roasted chicken with potatoes & carrots. My Austin, TX Library got an early copy of this great read and I thoroughly enjoyed this book. I have been to most areas of France she highlighted and I have already made some of Ann's recipes from her blog when she was in Paris. She also recommended some good Asian restaurants in Paris that we always visit as the Asian cuisine in Austin is so American - ugh! I also recommend the Soupe au Pistou. It is excellent, easy to make, and has become part of my permanent recipe collection. I love travel books about food. Sounds yummy! My favourite thing to cook is really hard - I love cooking, but I cook a lot of soups. So maybe butternut squash and coconut milk soup. YES! I'm reading "Dearie" right now, about the life of Julie Child and went online to buy Mastering The Art of French Cooking, and saw this. Added it to my wish list the other day! It's fate… that's what this is. Looks amazing! Might buy even if I don't win! My favourite thing to cook is macaroni cheese of all things! I like very much thin crust wood fired pizza. Not a very rare thing but I do live in Sri Lanka and finding it here is not so commonplace. my favorite thing to cook.... is probably my totally indulgent mac&cheese with mushrooms and bacon. SO UNHEALTHY. SO GOOD. I love cooking anything cheesy and love having fish cooked for me because I'm terrible at it. I've heard of that book and I've wanted to read it!! Good luck to me! And as for my favorite thing to cook..anything mexican! I love taco salad, baked southwest chicken egg rolls..yum! Ahh, I love a good foodie travel book! Combines my two greatest loves! One of my favorite French things to cook is a warm goat cheese salad with walnuts and vinaigrette. I had it in Paris and was totally hooked. Gosh, my favorite thing to cook or have cooked for me is a hard one; there are so many dishes. One I will mention that I would like cooked for me is the Cassoulet. My mother used to make this when I was a child. I haven't yet attempted to make this dish because of the amount of work, but I really do need to try. Oh man, I cook everything-- all the 'ettes-- Raclettes (not exactly cooking), Tartiflettes, and Galettes. Add the tians, the boeuf bourguignons, moules frites, and the not-so- French, but you find them everywhere here, tajines. Next on my list: a daube, maybe. Or perhaps a civet de sanglier. Yes, yes, I want this book!